Karuvepillai podi is something I used to eat most of the days in a week. From my childhood, when I was like 6 to 7 years old, my mom started this ritual (!) in order to keep my curly and thick hair healthy. Till now I am following the same even though my hair has reduced to thin because of child birth, change in water etc,. I make this podi in my mom's way every week in smaller quantity to keep it fresh. Here is the method. First microwave the curry leaves for 2 mts. It will become crispier, accordingly you adjust the time. Then in a dry pan, fry all the other ingredients one by one to golden brown and let it cool. 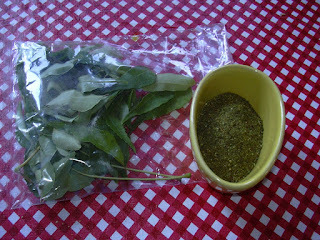 Grind it into a fine powder along with the curry leaves. Enjoy this podi with white rice and a tsp of sesame oil. Lovely podi recipes :-) hey microwaving curry leaves is a good idea. i always dry roast them in a kadai. I was trying to get hold of this recipe when i found urs..Would try it for sure. how long can i store it and use?? I make this podi and keep it for just couple of weeks.